Like the Marauder’s Map in Harry Potter, that shows the user where everyone is at in real time, it seemed like Milan knew exactly where to be and when tonight to pull this one off. To go into the Stadio Renzo Barbera and break the spell that they’ve had on us for the past 6 years, we needed maybe a little extra magic. In the end, our boys had everything they needed, and they pulled it off. The curse is broken, the monkey off our backs. Mischief managed. The game started full speed ahead, with Milan in full attacking mode. The first minute saw a great cross in from Abate, and separately, a shot over the bar from Nocerino. That was just the first minute. When Milan start like this, we usually take charge and win the game early, and today was no exception. With 63% possession, we got 19 shots off, with 12 on goal. On paper, one might say that Viviano failed by letting in 4 goals, but he also had an incredible 8 saves. And by incredible, I mean give that man a medal. Amazingly, there were no cards in this match. Despite an early foul on Miccoli by Bonera and incidents like when Abate took a hit to the throat and gave a shoulder back, the match was refreshingly clean and made Orsato’s job easier. The toughest little Dutchman ever. Emanuelson had another solid game, with a couple of shots early on. He would also assist on the third goal and generally wreak havoc for the Palermo defense until sustaining a worrying injury early in the second half. We can only hope it wasn’t serious, as Urby is the only Milan player not to miss a game due to injury this year. Robinho may not have made it on the scoreboard, but assisted on the first two goals and did everything shy of scoring before being subbed off in the 82nd. But most of the magic occurred in a 13 minute spell between the 22nd and 35th minutes. 22’: Ibra, assisted by Robinho, puts one past Viviano straight into the back of the net. 31’: Ibra, assisted by Robinho, buries another one in the back of the net. 35’ From distance, Ibra takes a ball from Emanuelson and launches it past Viviano for the hat trick. Mischief Managed. The ref could have blown the whistle and we could have stopped the game then. Or Milan could have sat back and defended for the next 55 minutes and rest on the laurels of their star who was impressing after coming off of a 3 game league suspension. Ask Viviano what happened. Because just 4 minutes after Ibra’s third goal, Viviano was forced into a brilliant save. Milan were not giving up or slowing down. Our boys were there for 90 minutes, and they pressed for 90 minutes, too. At the half, Mesbah came on for Antonini. Not sure if this was tactical because Antonini didn’t do much the first half, or if Allegri has already decided to play him on Tuesday and was resting. I sure hope it wasn’t for an injury or even precautionary. If you had any questions as to his loyalties, here is you answer. Viviano was once again very busy, with 2 saves in the 48th and another on a shot by Thiago Silva in the 52nd. In the 54th was when Emanuelson came off for El Shaarawy, and the youngster kicked it up yet another notch, I wonder if Palermo thought they were going to die with the pressure Milan kept on them. In fact, El Shaarawy had a great shot in the 56th, right after coming on, and forcing another great save from poor Viviano. But things went from bad to worse when in the 58th, Thiago Silva scored on an assist by El Shaarawy. It’s not as if Palermo had no chances. Like in the 61st, when Barreto took a dangerous shot that was saved by the post, Abbiati’s best friend. In fact, Palermo actually got 15 shots off, but only 4 were on goal, keeping Abbiati alert, but not really tested. Mesbah got a shot off in the 65th, but it was straight into the arms of Viviano and didn’t have much power on it. But then in the 72nd, the world turned upside down for a minute, as Mesbah clumsily bumped knees with Thiago Silva, and it was Bonera that actually made a great clearance. That was huge for me, because Bonera had been out of position and his usual clumsy self most of the night, forcing Abate and Silva to make up for his lack of quality. 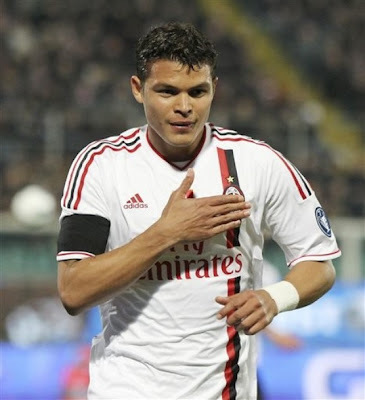 Let’s hope Thiago Silva is fine to play on Tuesday. Palermo had zero answers for Ibra, not even in numbers. For me, the match didn’t seem like it could get any better: a hat trick for Zlatan, and a deserved goal for Silva, who seemingly was playing for three people today. But then things just got even better: Pippo on for Robinho in the 82nd. And he played those 8 minutes asif it was a Champions League final. Umfortunately, the only real news he made on the pitch was an offsides call in the 87th. But still so refreshing to have a Pippo sighting again. Maybe if we keep scoring hat tricks (Ibra’s was the 3rd hat trick and the 3rd different player to score a hat trick for Milan this year,) we’ll be able to see Pippo more often. One other curse may have been transferred, it already seemed to have been broken, and that was the curse of Robinho’s sitters. Having found his cure, it seems that he transferred it to Zahavi, who had just come on in the 84th. The very next minute, he missed a sitter, Robinho style, sending the ball into orbit. It really isn’t so bad to watch when it happens to the other team. 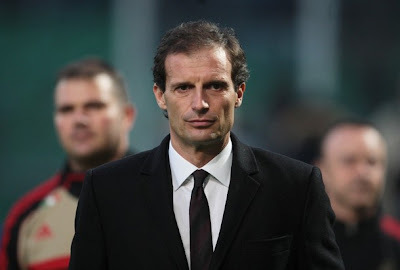 Despite his comments, Allegri knows the best way to silence critics is a trouncing. All in all, I really think that only being injury free could make this game any better. With concern about Emanuelson and Silva, those are the only things that could dampen this wonderful performance. Sure, Palermo were missing Balzaretti and Silvestre, but how many players were we missing? A magical performance full of confidence and pressing for 90 minutes straight. The goals were brilliant, and I was largely impressed with the way the team played. And perfect to send us into Tuesday’s match. The Curse of the Barbera? I don’t think so. Mischief managed.